The CITB Site Supervision Safety Training Scheme (SSSTS) course is intended for those who have or are about to acquire supervisory responsibilities. At the end of the course you will receive a CITB Site Safety Plus certificate that is valid for five years. This course is intended for first line Managers – those who have or are about to acquire supervisory responsibilities. The course provides an introduction to health and safety, welfare and environmental issues. It will also provide a sound knowledge base to enable them to give valuable assistance in safely managing a site. To provide you with an overview of their responsibilities for health and safety on construction sites. 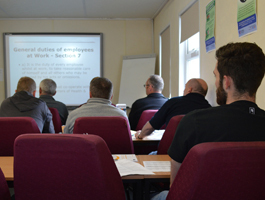 The course provides the ideal introduction for those supervisors who have had some little previous health and safety training.